I am not an addict…but somehow I imagine the way I feel today must be somewhat similar to how an addict feels when she has relapsed. I was doing so well. I’ve worked so hard. If you have been following this blog from the beginning, you know that I started it six months ago because I needed to pull myself out of a depression. By August I felt vibrant and grateful – even optimistic. I hit a speed bump at the beginning of September. I thought it was the change of seasons that brought it on, but looking back, I think it was intuition. I felt the Elephant coming before I could see it and name it…like tremors in the earth on which I stood. Then, rather than a monkey on my back, it was the Elephant that got me. I have relapsed into a place of complete fatigue and helplessness. The worst part is – like that relapsing addict, I feel ashamed. I have so many reasons NOT TO BE HERE…AGAIN. But, the Elephant…the Elephant wrapped its trunk around my legs even as I tried to run. I’ve toppled to the floor, and now he sits squarely on my chest. “Don’t forget to breathe,” they say. 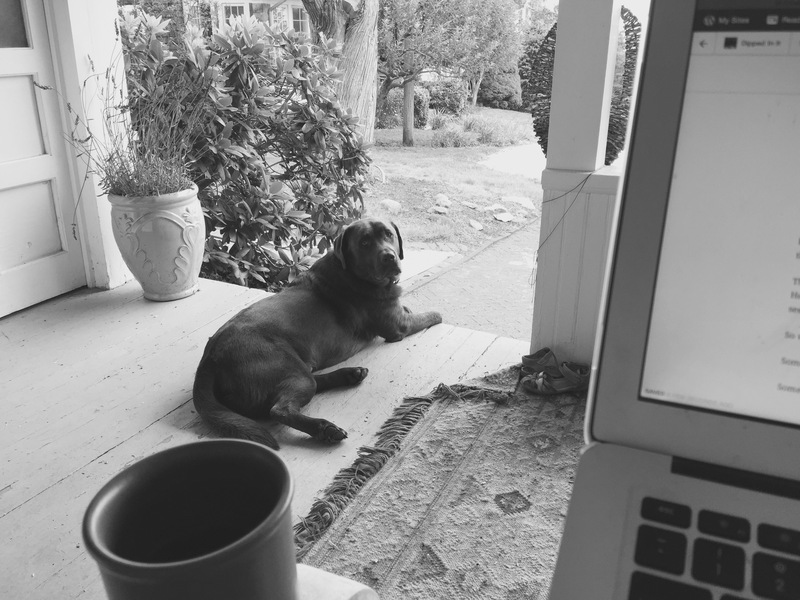 Fittingly, as I sit on my porch writing this…a dog is howling as if he is truly suffering. I’ve already investigated…still in my pajamas, soaking my slippers in the wet grass as I trespassed; compelled to make sure the dog wasn’t trapped and wounded somewhere. He wasn’t…not really. He was just…alone. We locked eyes through the window. He stopped howling for a moment, considering me. Then he resumed his sad, wounding song. There was nothing I could do…his pain was coming from a void I couldn’t fix nor fill. Back on my porch, I am forced to listen to him in his grief. He won’t stop. I think about drowning out the sound with some music, but somehow that seems disrespectful. So we sit here, Louie and I, witnesses to this dog’s suffering. Louie occasionally whimpers in sympathy. Someone to hear you – or to witness you in some way…until such time as things in your world can make sense again.